"We've been meeting them in the wilderness, and in our dreams, since the dawn of human history. Bears have been celebrated in art and myth since we began drawing on the walls of caves. No beast casts a longer shadow over our collective subconscious. Perhaps more than any other animal, the bear remains the very heart of our concept of wilderness." This is a long post, compiling various books I've been intending to review. As a kid, I can remember going often to Melbourne Zoo, something I always keenly looked forward to. Sometimes I'd sketch animals (much as my own children do now). Many of the enclosures were pretty depressing in those days, not least of all the bear pits near the exit. There was a row of these - like jail exercise yards made of cement and bars with a pool in the middle - and they housed a brown bear who sat up cutely holding his toes, what were then called Himalayan black bears (my sister called them "Collingwood bears" on account of their matching the football team's colours), and some polar bears in the end enclosure. The Zoo apparently had some bad luck with bears through those years, particularly one crazy polar bear called Ronald, who had been passed from zoo to zoo. Realising what a relic those pits were, the Zoo Board closed them in 1980 and opened the current spacious bear exhibit in 1986, complete with a stream, rocks and dirt, trees and foliage. The bear contingent at Melbourne Zoo currently consists of endangered Syrian brown bears. I feel privileged to have seen these other bear species (including two visiting giant pandas), so was easily drawn to Brian Payton's In Bear Country. This was the best read since, well, David Quammen's Monster of God (see below). Essentially, Payton tours the world visiting the last refuges of bears - the surviving eight species. Bears have a strong grip on the human imagination for a multitude of reasons, including their similarities to us (such as an omnivorous diet and the ability to stand on two legs), their totemic and predatory power, and their company down through human history. Payton, like Quammen (and all good nature writers), understands and communicates this dichotomy - humanity feeling the significance of the wild, at times coexisting with it, yet ultimately ensuring its destruction. While I was already aware of these eight bears - from Asia the sloth bear, sun bear, moon bear and giant panda; from South America the spectacled bear (a relict species); the North American black bear; the polar bears of the frozen North and the wide-ranging brown (or grizzly) bear - this book captures their current place in the wild and human worlds perfectly. Sadly, like Monster of God it will probably serve as a final historical snapshot before many reach the tipping point of extinction. Although Payton in no way preaches, he does describe the continued unnecessary and cruel exploitation of the bears, whether for misguided medicine (China), culinary exploitation (South-East Asia), insensitive development (Italy) or "recreational" hunting (North America). However, the book is immensely readable and enjoyable, revealing people relating to bears in many different ways, often in contrast with each other. "While we humans may be the most reflective members of the natural world, we're not (in my view, anyway) its divinely appointed proprietors. Nor are we the culmination of evolution, except in the sense that there has never been another species so bizarrely ingenious that it could create both iambic pentameter and plutonium. Throughout the course of the human story, one reminder of our earthly status has been that, at some times, in some landscapes, we have served as an intermediate link on the food chain." This one came out a few years ago. David Quammen remains my favourite modern nature writer - he's adventurous, inventive and thoughtful - evidently a risk-taker with a widely informed background. The Song of the Dodo focused on biodiversity in island wildlife, particularly with relation to evolution, so I was drawn to his study of human relationships with the last surviving big predators, those beasts of our legends and nightmares who have exercised their influence on human evolution and are now in final decline. Quammen visits the lions of Gir forest in India, the crocodiles of Northern Australia, the giant brown bears of Romania and the Siberian tigers of Far East Russia, and the people who live in close proximity with these beasts. A notable understudy in this show is the tenacious and sneaky leopard, "the perfect predator." 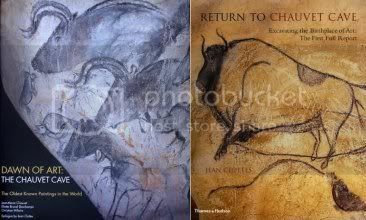 Quammen, like Payton after him, is drawn in closing to the recently discovered (1995) Chauvet Caves of France - an incredible gallery of the earliest human art, amazingly rich in both species and accurate naturalistic detail. This incredibly rich gallery of art (much of it seemingly from the hands of one artist) clearly connects us to our early ancestors, reminds us of much lost in between, but mostly celebrates a connection to the natural world. There's a dazzling array of European fauna only glimpsed elsewhere - cave lions, cave bears, woolly rhinoceros, mammoths, giant deer, horses, aurochs, European bison, musk oxen, a cave hyena and a leopard. Curiously, the lions have two eyes, moved Picasso-like to the front of their faces (otherwise the depictions are naturalistic), whereas the bears have no eyes at all. Perhaps that's a reminder that eye contact with bears is an unwise social manouvre :). Of course, no discussion of big surviving predators, and bears in particular, would be complete without reference to the late Timothy Treadwell. 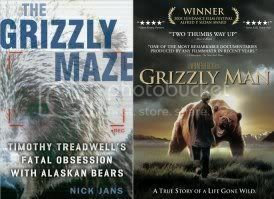 Last year I read Nick Jans' The Grizzly Maze, which deals with the demise of bear enthusiast Timothy Treadwell and his girlfriend, Amie Huguenard, killed by a rogue bear in 2003, later in the season than he usually stayed. Treadwell had successfully spent 13 years among the bears of Katmai National Park in Alaska. For those interested in the details of this part of the story, I recommend this book. Last night, I finally caught up with Werner Herzog's acclaimed film, Grizzly Man, which consists of equal parts of Herzog's own interviews and Treadwell's original footage, edited to make a certain sort of narrative sense. As has been pointed out, there's almost an air of "mockumentary" about this in places - it's certainly funny in spots (as well as tragic and beautiful), and Treadwell was a larger than life character. Much as I enjoyed this film, it left a bad aftertaste in some ways. Herzog's thesis (so well realized in Aguirre, Wrath of God among others), is here used to steer Grizzly Man in a particular direction, with very selective editing and careful sequencing. What is telling is how little of Treadwell's own footage is used (given that there were apparently over 100 hours available). Yes, Timothy Treadwell was misguided (and even deluded) in parts of his approach, but he appears at times tragically aware of the sequence of mistakes that led to his ultimate demise - going against the understanding and "rules" he has formerly observed - in choice of campsite, staying beyond the usual time, interacting with strange bears. In the final sequences Treadwell does appear to have a certain fatalism about him. While he accepts his own risks, the ultimate tragedy is that this misjudgment led also to the death of Amie Huguenard, as well as to the destruction of several of the bears. Considering much of the footage could be regarded as a personal video diary (not intended for public consumption), Herzog's selections can tend to labour the points he wants to make (one particular long sequence featuring Treadwell ranting and swearing extensively - interspersed with Herzog's narration - is difficult to watch). Treadwell was a lively, troubled character, but evidently had considerable empathy and understanding of nature, if on his own terms. That he tends to project feelings onto the animals around him seems to me comparable to what many pet owners are guilty of. The most enjoyable sequence features a couple of foxes and Treadwell's hat - the foxes are major support players in this film. Herzog's editing of the material (while selective) is undeniably compelling and flawless, and his appreciation of Treadwell's film-making abilities shows through, in spite of their conflicting attitudes. Grizzly Man is an interesting film, probably telling more about Herzog's preoccupations than providing a definitive depiction of Treadwell, though it certainly tells a lot about humanity's isolation from nature. I may seek out Treadwell's own book and film. One minor point - the poaching that Treadwell refers to is apparently real and is mentioned in Brian Payton's book.